Extension of the newly formed actin filament branches occurs at the interface between the leading edge and the existing actin filament network  and is maintained by mechanisms such as actin treadmilling. As reviewed in  a number of models propose mechanisms by which actin filament dynamics lead to the generation of protrusive force, and subsequently lamellipodia extension. Early models, including the ‘Brownian ratchet’ theory  and the ‘Elastic ratchet’ theory , considered the process from a molecular level where each actin filament acted independently of others. Extending filaments would push against the membrane, and in the process a gap, produced either by membrane resistance or by the thermal wave like properties of an elastic non-rigid filament, would allow for the addition of G-actin onto the barbed end of extending filaments. Although these models could account for the generation of protrusive force, they did not consider actin polymerization from an in vivo perspective where its dynamics are influenced by an array of factors. Direct interactions between growing actin filaments and the membrane were addressed in later models such as the ‘tethered ratchet’ model  where filaments were proposed to attach transiently to the membrane and protrusive force was generated by the addition of G-actin onto compressed filaments which had temporarily dissociated from the membrane. Similarly the influence of surface curvature was considered in the ‘elastic propulsion’ model  whilst the role of the greater filament network on filament polymerization was considered in the ‘autocatalytic branching’ theory . With the specific factors that mediate force generation from F-actin assembly still to be defined, models such as those mentioned above will continue to be developed and built upon. It is clear however that actin treadmilling is integral to each model, being essential to both F-actin assembly and lamellipodia growth. Filament extension occurs via the ‘actin treadmilling’ mechanism, with lamellipodial growth reflecting the balance between actin filament polymerization at the barbed ends and retrograde actin flow towards the cell body (reviewed in ). Motile cells adjust the rate of actin assembly in specific regions of the cell to outpace retrograde flow, thereby favoring cell contact and protrusion in a particular direction . In certain motile cells (e.g. fish keratocytes), the actin cytoskeleton remains stationary relative to the substratum, indicating that there is virtually no retrograde actin flow and therefore the rate of actin polymerization equals the rate of protrusion . 1. Polymerization of actin filaments at the leading edge is translated into protrusive force. 2. Membrane protrusion facilitates the binding of transmembrane cell surface receptors to the substratum components. New adhesions are rapidly linked to the network of actin filaments. 3. The combined activity of retrograde actin movement and contractile forces produced by stress fibers generate tension to pull the cell body forward. 4. The forces produced by the contractile network combined with actin filament and focal adhesion disassembly, helps to retract the trailing cell edge. (Note: the “space” between the cell and the substrate [shown as a gray bar] is exaggerated in this diagram). 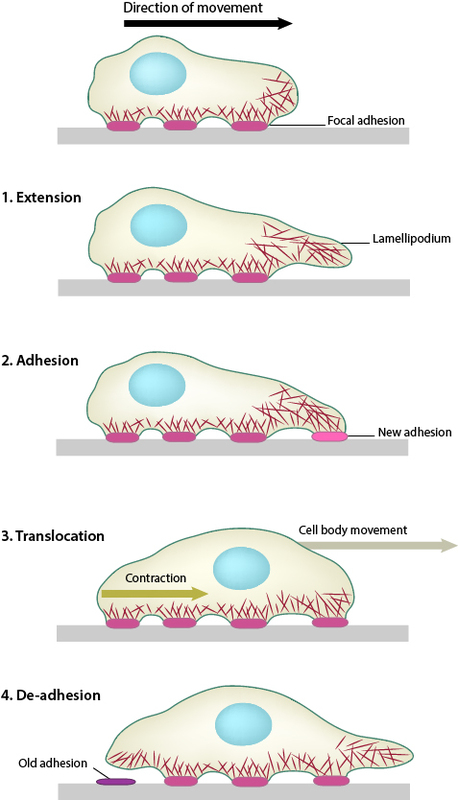 Lamellipodial extension is often coupled to larger events that facilitate cell motility and mechanosensing. For example, extension of the actin filament network is essential in periodic contractions. This process, is primarily driven by myosin motor proteins and allows the cell to sense and measure the rigidity of its surroundings. Myosin motors localize behind the actin filament network, making filament extension essential to facilitate the rearward movement of older filaments towards these motors – a process resulting from the retrograde movement that occurs during filament extension. Along with periodic contractions, lamellipodial extension may also occur along with peripheral membrane ruffling or with circular dorsal ruffles. 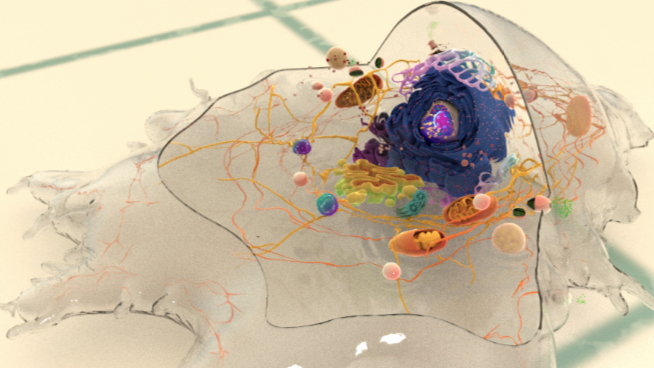 Although the lamellipodial actin network is highly dynamic, moments of pause and stasis have been reported . This has been correlated to the angle of actin filaments at the membrane interface, with a greater number of ‘low angle’ filaments being seen to align in parallel to the leading edge during longer pauses . These ‘low angle’ filaments continue to extend whilst shorter ‘high angle’ filaments depolymerize, resulting in a net reduction in protrusion . Pause and stasis also allow time for maturation and elongation of nascent focal adhesions along the actin network . This has been shown to occur particularly at the interface of lamellipodia and lamellae . As the lamellipodia continues to spread and expand forward, adhesion sites form along the leading edge. These sites not only provide traction for the cells forward movement, but permit the cell to sense and measure the rigidity of its substrate. Formation of these adhesions is a complex process, involving a number of steps and functional modules. Particularly important in lamellipodia function is the spatial arrangement of adhesions at the leading edge. Lamellipodia extension and retraction is not uniform across the whole cell and similarly, adhesion sites will not be uniformly distributed. Instead a number of factors may influence arrangement including chemistry of the extracellular matrix, substrate stiffness and a cells growth conditions. Interestingly, distribution of adhesion sites was found to be coupled to actin polymerization, with conformationally activated, but unliganded β1 integrins, shown to be interacting with elongating filaments . Importantly, this interaction permits a sideways distribution along the leading edge, ensuring clusters of β1 integrin are positioned at the very front of cell protrusions. β1 integrin was also found, in the same study, to localize at the tips of growth cone filopodia . Paxillin, a scaffold protein, has recently been shown to integrate physical cues sensed by adhesion complexes in order to confer directionality for lamellipodial protrusions .